The victim's feet were secured on a small platform. Using wooden or metallic wedges, the torturer slowly fixed the wedges underneath the victim's nails, almost exclusively for confessionary purposes. What followed next was agonizing pain for the victim, as failure to confess would mean wedging the next nail, and the next. Toe wedging was considered the prelude to more painful and humiliating torture methods that would ensue if the victim failed to confess. Since the same wedges were used on several victims, it was common for infections, amputations and even death to result. Toe wedging became popular hundreds of years before the Middle Ages, its origins probably date to Ancient Egypt or before. 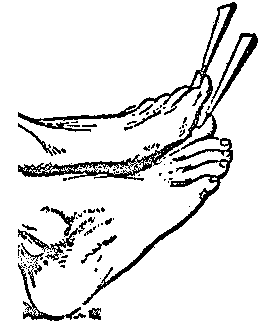 A variant of toe wedging was finger wedging, which was similar, except that the wedges were presses against the fingernails.